Ole Christensen Rømer (September 25, 1644, Århus – September 19, 1710, Copenhagen) was a Danish astronomer who demonstrated that light had a finite speed by measuring apparent changes in the periods of the revolution of Jupiter's moon, Io. Rømer also developed a temperature scale, and invented the mercury thermometer. The Rundetårn, or round tower, in Copenhagen, on top of which the university had its observatory from the mid-seventeenth century until the mid-nineteenth century, when it was moved to new premises. The current observatory there was built in the twentieth century to serve amateurs. Rømer was born on September 25, 1644, in Århus, Denmark, to a merchant and skipper, Christen Pedersen, and his wife, Anna Olufsdatter Storm, daughter of an alderman. Christen Pedersen had taken to using the name Rømer, which means that he was from Rømø, to disambiguate himself from some other people named Christen Pedersen. There are few sources on Ole Rømer until his matriculation in 1662 at the University of Copenhagen, where his mentors were Thomas and Rasmus Bartholin, the later having published his discovery of the double refraction of a light ray by Iceland spar (calcite) in 1668 while Rømer was living in his home. Rasmus Bartholin had been given the task of preparing Tycho Brahe's observations for publication, and enlisted Rømer's help from 1664 to 1670. Rømer joined the observatory of Uraniborg on the island of Hven, near Copenhagen, in 1671. In 1671, the French astronomer Jean Picard was dispatched to Denmark to examine Brahe's observations and compare them with those of Giovanni Domenico Cassini in Paris. Rømer assisted him in this task, and then accompanied him the following year to Paris, where Rømer entered the employ of the French government. Louis XIV made him teacher for the Dauphin, and he also took part in the construction of the magnificent fountains at Versailles. Rømer became the first foreign member of the French Academy of Sciences in 1672. It was during this period that Rømer conducted observations of the moons of Jupiter. Unexplained but regular variations in the times of their revolution, which should have been uniform, led Rømer to speculate that there was a limit to the speed of light. This premise enabled Rømer to predict changes in the orbital periods. Rømer announced his findings in 1676. In 1677, Rømer returned to Denmark and was appointed professor of astronomy at the University of Copenhagen. In that same year he married Anne Marie Bartholin, the daughter of Rasmus Bartholin. He was active also as an observer, both at the University Observatory at Rundetårn and in his home, using improved instruments of his own construction. Unfortunately, his observations have not survived. They were lost in the great Copenhagen Fire of 1728. However, a former assistant (and later an astronomer in his own right), Peder Horrebow, loyally described and wrote about Rømer's observations in a work published in 1735 under the title Basis Astronomiae. Rømer was appointed royal mathematician in 1681, and in 1683, he introduced the first national system for weights and measures in Denmark. Initially based on the Rhine foot, a more accurate national standard was adopted in 1698. Later measurements of the standards fabricated for length and volume show an excellent degree of accuracy. His goal was to achieve a definition based on astronomical constants, using a pendulum. This would happen after his death, practicalities making it too inaccurate at the time. Notable also is his definition of the new Danish mile. It was 24,000 Danish feet, which corresponds to 4 minutes of arc latitude, thus making navigation easier. Rømer had developed a thermometer so that he could monitor the temperature and its effect on astronomical instruments. He was among the first to develop a temperature scale, dividing the temperature between freezing water and boiling water into sixty degrees. In 1708, Daniel Gabriel Fahrenheit paid Rømer a visit to see first-hand how he made his thermometers. Fahrenheit then developed his own thermometers and the Fahrenheit scale, which is used to the present day. Rømer is credited with inventing the mercury thermometer. In 1700, Rømer managed to get the king to introduce the Gregorian calendar in Denmark-Norway—something that Tycho Brahe had argued for in vain a hundred years earlier. This calendar, originally introduced by the Catholic Church in the sixteenth century primarily for liturgical purposes, was a correction to the Julian Calendar that had been followed virtually unchanged since the time of Julius Ceasar. 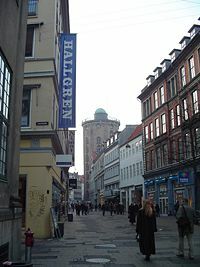 Rømer also established several navigation schools in many Danish cities. 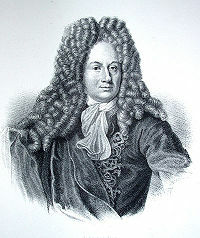 Rømer died on September 19, 1710 in Copenhagen. The determination of longitude is a significant practical problem in cartography and navigation. Philip III of Spain offered a prize for a method to determine the longitude of a ship out of sight of land, and Galileo proposed a method of establishing the time of day, and thus longitude, based on the times of the eclipses of the moons of Jupiter, in essence using the Jovian system as a cosmic clock. This method was not significantly improved until accurate mechanical clocks were developed in the eighteenth century. Galileo proposed this method to the Spanish crown (1616–1617) but it proved to be impractical, because of the inaccuracies of Galileo's timetables and the difficulty of observing the eclipses on a ship. However, with refinements the method could be made to work on land. The reason why synchronized time is important in measuring longitude is that two observers, if they know they are making measurements at the same time, can measure the position of the stars with respect to the horizon, the difference in the angle between the two measurements of the same star with respect to a plane passing through the poles of the earth equaling the difference in the longitude of their positions on the earth's surface. Some additional data such as the diameter of the earth would yield the distance between the two positions as well. Conversely, if the distance between the two positions could be accurately supplied, the earth's diameter could be calculated from the data. After his studies in Copenhagen, Rømer joined the observatory of Uraniborg on the island of Hven, near Copenhagen, in 1671. Over a period of several months, Jean Picard and Rømer observed about 140 eclipses of Jupiter's moon Io, while in Paris Giovanni Domenico Cassini observed the same eclipses. By comparing the times of the eclipses, the difference in the longitudes of Paris and Uranienborg was calculated. Rømer noticed upon examination of the data that he collected along with the observations of Cassini that the times at which the satellite Io emerges from the shadow of Jupiter in each of its revolutions about the planet are continually lengthened as the earth recedes from Jupiter, while in a similar but reverse manner, the times between emergences are shortened as the earth approaches Jupiter. More specifically, Rømer reported to the French Academy of Sciences in September of 1676 that between early September and the 16th of November of that year, a delay of about 10 minutes should accrue. His prediction was verified, and reported in a memoir published in December in the Journal des Savants. Because of the periodic nature of the variations, and the reversal of the phenomenon when the earth approached Jupiter, Rømer put forward the hypothesis that light had a finite velocity, and that variations in the time light took to reach the earth over changing distances between the earth and Jupiter accounted for the changes in the observed times of the revolution of Io. Rømer did not actually calculate the speed of light from his observations. At the time, the distance between the sun and the earth was still only a roughly calculated quantity, while the earth's elliptical path around the sun meant that the distances between the earth and Jupiter did not accrue uniformly, but varied in a complex manner according to the time of year and the position of the earth in its orbit. It would be left to later investigators to pin down an actual speed of light based on these phenomena. Rømer appears to have been more interested in correcting tables of the revolution of Jupiter's moons for the sake of measuring longitude than he was in fixing the speed of light. His important contribution was that he recognized the true nature of the phenomenon, and quantified and predicted the observed effect on the observations of Jupiter's moons. That light had a finite speed was a finding that the scientific community resisted accepting, even though two thousand years earlier, Aristotle had contemplated the possibility of a finite speed of light in analogy to sound and even suggested a way of measuring it. Still, the predominant view was that the speed of light was infinite. The first scientist who attempted to calculate the speed of light based on Rømer's observations was Christiaan Huygens. In his Mathematical Principles of Natural Philosophy (1713), Isaac Newton credits Rømer as the first to observe the velocity of light through observations of Jupiter's moons. (G. G. and J. Robinson 1798) However, Rømer's views were not fully accepted until measurements of the so-called aberration of light were made by James Bradley in 1727. Bradley's observations and analysis depend on the fact that the velocity of the earth in its orbit around the sun distorts the actual position of any luminous body in the heavens, the distortion depending on the ratio of the velocities of the earth to that of light. This causes each star to appear to transcribe a small ellipse in the sky over a period of a year. Measuring this distortion yields a value for the speed of light. Bradley's measurements were in harmony with Rømer's observations, resulting in almost universal acceptance of Rømer's original conjecture. In 1809, again making use of observations of Io, but this time with the benefit of more than a century of increasingly precise observations, the astronomer Jean Baptiste Joseph Delambre reported the time for light to travel from the sun to the earth as 8 minutes and 12 seconds. Depending on the value assumed for the astronomical unit, this yields the speed of light as just a little more than 300,000 kilometers per second. A plaque at the Observatory of Paris, where Rømer was working at the time of his conjecture, commemorates what was, in effect, the first measurement of a universal quantity made on this planet. In addition to inventing the first street lights in Copenhagen, Rømer also invented the transit instrument in 1690. This instrument is used primarily to measure the position of stars. He is also credited with the invention of the mercury thermometer in 1709. The Ole Rømer Museum is located in the municipality of Høje-Taastrup, Denmark, at the excavated site of Rømer's observatory, Observatorium Tusculanum, at Vridsløsemagle. The observatory operated until about 1716 when the remaining instruments were moved to Rundetårn in Copenhagen. There is a large collection of ancient and more recent astronomical instruments on display at the museum. Since 2002 this exhibition is a part of the museum Kroppedal at the same location. ↑ In scientific literature, his name is alternatively spelt "Roemer," "Römer," or "Romer." ↑ Per Friedrichsen and Chr. Gorm Tortzen, Ole Rømer - Korrespondance og afhandlinger samt et udvalg af dokumenter (Copenhagen: C. A. Reitzels, 2001), p. 16. ↑ Friedrichsen and Tortzen (2001), pp. 19–20. ↑ Christian Huygens (January 8, 1690) Treatise on Light. Translated into English by Silvanus P. Thompson, Project Gutenberg etext, p. 11. Retrieved on April 29, 2007. ↑ William Somerville Orr, George Gore, Marcus Sparling, and J. Scoffern, Orr's Circle of the Sciences: A Series of Treatises on the Principles of Science with Their Application to Practical Pursuits, Practical Chemistry (London: Houlston and Stoneman, 1856), p. 391. ↑ A History of Wonderful Inventions (New York: Harper and Brothers, 1849), p. 83. Catteau-Calleville, J.-P. 1802. Tableau des états danois envisagés sous les rapports du mécanisme social. Paris: Chez Treuttel et Würtz, pp. 127–128. MacKay, R. J. and Oldford, R. W. 2000. "Scientific Method, Statistical Method and the Speed of Light." Statistical Science 15(3):254–278. (Mostly about A.A. Michelson, but considers forerunners including Rømer. Also available online: http://www.stats.uwaterloo.ca/~rwoldfor/papers/sci-method/paperrev/). Robinson, G. G. and J. (Paternoster Row, London, England). 1798. A New and General Biographical Dictionary; containing an historical and critical account of the lives and writings of the most eminent persons in every nation; particularly the British and Irish; from the earliest accounts of time to the present period. London: Printed for G.G. and J. Robinson (etc. ), pp. 162–163. Smithsonian Institution. 1855. Annual Report of the Board of Regents of the Smithsonian Institution. Washington: A.O.P. Nicholson, public printer, pp. 141, 146–7. Roemer, Ole Christensen at the Galileo Project. Ole Rømer on the 50 Danish Kroner banknote. This page was last modified on 19 December 2018, at 16:27.